The works of the pioneers in twentieth century modernism are seething with artistic concepts, some of which are applied in full while others are merely suggested, hinted at, left to ferment and eventually come to life in other artists’ works. The great Russians in the first three decades of the last century left open spaces in their canvases; manipulated size, location and colour to an extreme; mixed traditional and industrial materials; hinted at series, at hazard as part of creation, at the haunting ability of lines to recall fixed perceptions and then turn them inside out; they even created mechanical artworks. There were also the Western and Eastern European artists, the Dutch group De Stijl, Georges Vantongerloo, Lajos Kassák and Henryk Berlewi, each one of them pushing the boundaries of perception into unknown territories. Given two world wars and leaders who had notions on what art should be like, read Stalin and Hitler, this avant-garde either changed or went underground. The question that arises for us then, is this: how did those original concepts percolate the thinking of artists decades later who lived in different continents in a pre-internet age? Because the truth is that painters and sculptors in Europe and South America were already by the late 1950s creating works which were open - any work a fraction of itself - some of them evolving haphazardly or from mathematical and logical formulae; works which tantalised to its limits the brain and retina of the beholder; works which moved, turned, reflected light, created unforeseeable changes in the surface of things, and most challenging of all, were able to control the spatiality of colour and return to the absolute flatness of the picture plane. The explanation could be partially found in the teaching of the Bauhaus, which followed the Russian input much more closely than we thought, or in the travels of Max Bill, a former student of the Bauhaus, to Brazil in 1953 and his publications in the Argentinian journal Nueva Visión, or by the chance presence in Paris of European, middle European and North and South American artists. A fuller explanation would require a place and someone with an open mind at the head of it. In 1939, Denise Bleibtreu, a young woman bored with the work that she and her sister were doing at their apartment in Rue La Boétie, creating fashionable materials for the Paris magazins, took time off to join the accolade around Jacques Prévert in the Café de Flore. There she met a designer who had studied at the Hungarian Bauhaus. His name was Victor Vasarely. All through the war they made plans to open a gallery. When the Denise René Gallery did open in 1944, Vasarely had the first solo exhibition of his life. And so things started. One: set off with a splash to surprise and call for attention (an unknown and exciting artist´s exhibition, like Vasarely´s). Two: if you do get and audience (and she did, in a post-war Paris), give them also something they possibly already love, mixing the work of masters from the previous generation like Kupka, Picabia, Ernst, Arp and Duchamp, with those of the new. Three: start debates on different artistic trends in the gallery; this will clarify ideas, define ways to continue and attract artists of all sorts (she had intellectual and drinking soirées on Saturdays). Four: begin selecting the artists whose work satisfies your ideas and organise collective exhibitions as often as you can (in 1946, she presented 33 artists in just one show, most of them household names nowadays). Five: if sales are hard to come by, change the context, establish relations with galleries abroad (1948, Tokanten Gallery in Copenhagen, for instance) and present your artists there. Then import them back glowing in foreign prestige. Six: if the exterior relations were deemed successful, keep them up and accept participating in mixed exhibitions with artists from the host country (Linie 1949, Copenhagen; Klar Form, 1951-52, Copenhagen, Oslo, Helsinki, Liège; L´ École de Paris, Glasgow, Aberdeen; Herbin, Baertling, 1953, Stockholm; Exposition d´Art Abstrait Italien et Français, Rome and Milan, etc. She went as far as Argentina). 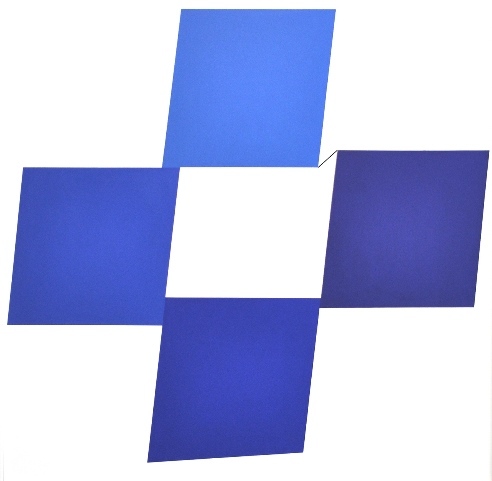 Seven: bring the concepts out, organise startlingly shrewd thematic exhibitions, like Diagonales in 1952, and the famous Le Mouvement of 1955, invented by Denise René and Vasarely in which Pontus Hulsen and Roger Bordier collaborated, and which has gone down in history as the birth of kinetic art. Eight: be notoriously the first in doing something, like giving Mondrian his first solo show in Paris, or Albers, for that matter. Nine: expand your clientele; produce your own editions of prints and multiples for the smaller wallets of young or less affluent collectors (these are still so popular that sell almost like originals). Ten: be present at the international art fairs, as one of your artists may win the first prize like Julio Le Parc at the Venice Biennale (this was a must for her until well in her nineties). Eleven: if you have too much demand, open your own galleries in other artistic cities like Dusseldorf and New York. Twelve: if your empire collapses, retrench and continue (which she did after the 1970s oil crisis). Although a random collection, the An Open Mind exhibition has nonetheless gathered works in which some of the main concepts mentioned above are evident. There is the austere constructivism of André Gaston Heurtaux (1933-34) acting as a reminder of the principles that were the aspiration of the gallery from its beginnings. Sophie Taueber-Arp´s Untitled drawing (1939) presents a different simplicity of construction and one no less rich; her neatly curved lines carve surfaces next to each other and are yet disconnected. Yaacov Agam´s Constellation (1956) retakes Malevich´s ability to disrupt the picture plane with elements of different sizes and colours, but with a twist, because Agam´s elements do have a third dimension; the result is a highly unstable constellation of very understated coloured forms. The gouache by Sonia Delaunay Composition en Vert, Rouge et Bleu (1959) shows the control she had over the picture plane, her shapes and colours holding each other in contained effervescence. Olle Baertling´s Odir (1957) and Voisinage (1964) by the Brazilian Cícero Dias, do exactly the opposite to the Delaunay, leaving us with an everlasting conundrum between surface and space. Geneviève Claisse in Cercles Vert/Noir (1969-70) and Quark Bleu (1975) playfully deals with the Gestalt issue of figure and background, letting the viewer´s mind shift from one vision to another, and yet another... 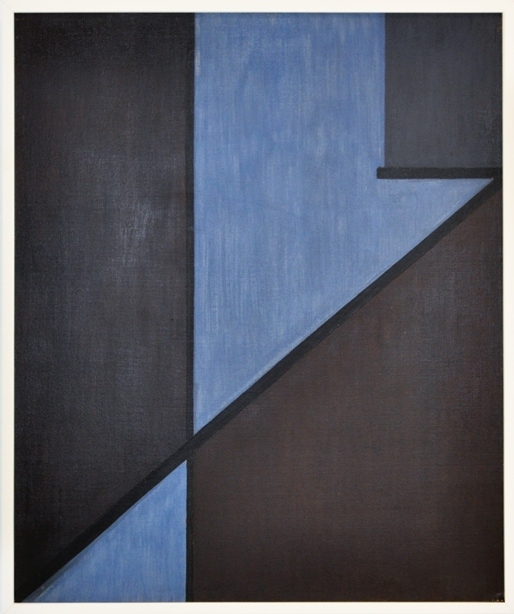 Similarly, the great Polish master Henryk Stazevsky floats his diagonals, leaving them to inadvertently disrupt the painted canvas. Victor Vasarely (Epsylon, 1958-62) and Jesús Soto (Tirature, 1966) will serialise their magical interplay with space; they know the power of patterns to suggest the improbable, the inability of the retina to deal with too strong a contrast between black and white and the beautiful intermediary places that appear between these two tones. 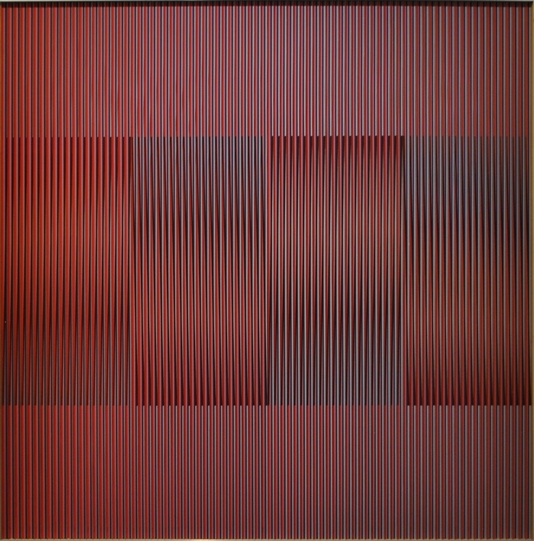 Both Carlos Cruz-Diez (1977)and Agam (2003) use a raised grid in their later work. Cruz-Diez’s Physichromie 1096 exploits the optical instability in the borders of adjacent stripes and accentuates it by adding vertical translucent elements between them so as to convey a stream of colour in front of the work. 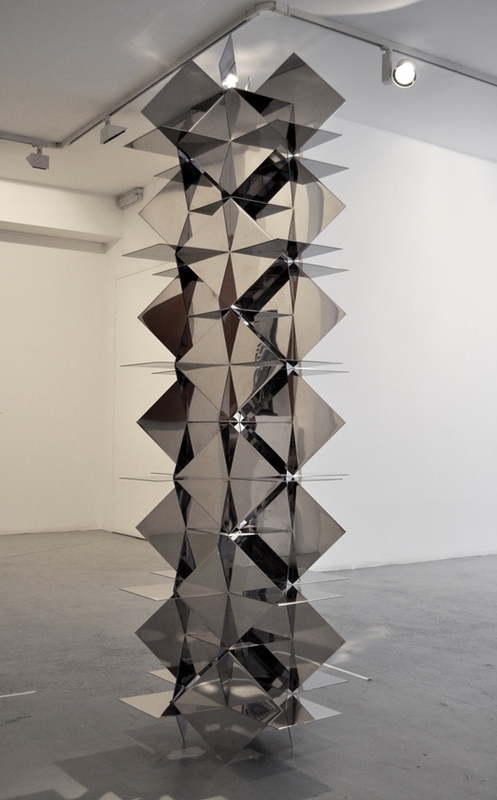 Agam, by contrast, in Soir Noir (2003), uses the angularity of his long components to energise the composition of static shapes and make them dependent of the viewer´s position. The sculptors Francisco Sobrino, in his Structure Permutationelle (1966-70), and François Morellet with his Sphère of 1962, both chose stainless steel for very different purposes. The intersecting planes of Sobrino’s construction reflect not only themselves and each other, but also the viewers and the atmosphere surrounding them, thus turning the rigid material into a shifting sequence of images, mostly reminiscent of a painting. Morellet´s mobile sphere reconfigures itself by the second, the beholder transfixed by the never-ending sequence of three-dimensional patterns. In Martha Boto’s Untitled box of 1966-68 and Gregorio Vardanega’s Couleurs Sonores, a mechanical device or programme determines the changes in the work and the work in turn, changes its environment. Denise René died in 2012, eleven months short of the century. She wanted the works of her personal collection to belong to the French museums. The ones in the Maddox Arts Gallery come from the Denise René Gallery where her nephew Denis Kilian, as current manager, continues in the same spirit to champion works of artists capable of enriching our perception with resources of our age and time.